a3Genealogy: New Genealogy TV Show - "I Should Have Known"
This was a TLC TV Pilot. I believe it works on ratings. If enough people watched they choose if they want to continue filming! I hope they loved it as much as the people I've heard from. It was a fascinating format! I just watched the show. I was busy the night it was on but I recorded it. I liked it a lot and I hope to see more! Thank you. As it was a TLC pilot, its continuance will be based on ratings. Fingers crossed! I would have loved to watch this show, had I known it was coming on. I saw a brief clip at the end of Long Lost Family. I had it recorded, but didn't get to watch until a few days later. When I checked the guide, this new show is no where to be found. Will there be more episodes coming? 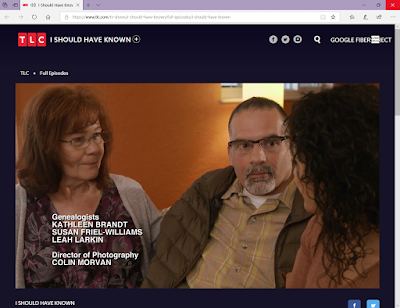 I have Google Fiber, but once I logged in to Google Fiber, I was able to see the whole episode. I loved the show and I hope it will ultimately become a series. Me too. And from what I heard others would love it too! I'll ask Santa! I didn't see it's original airing but found it after watching a DVR recording of Long Lost Family. I watched it on demand. Wow, I loved it. I can relate as I was raised believing the man that I thought was my father, was not. It was a hidden secret that just recently came out. Please show me more shows like this. They give me hope. I sure hope it comes becomes a series. I loved this show. I am heavy into genealogy and watch all these type shows. Great show, this needs to be a series. Great show, make it a series!! !